Bagless vacuum cleaner sales are rising steadily, with many emerging markets in Asia Pacific witnessing robust growth, according to a study carried out by research firm Fact.MR. The report projects Asia Pacific to remain a lucrative market for bagless vacuum manufacturers throughout the assessment period of the study 2018-2028. The research study highlights the key factors influencing the Asia Pacific bagless vacuum cleaners market. According to the report, rising trend of automation, combined with the shift towards ‘wireless’ are likely to provide an impetus to the growth of the market. This has led to an increase in sales of wireless vacuum cleaners, although corded still dominates the market -- both, in terms of value and volume. In addition to offering insights on the Asia Pacific market, the report also studies the vacuum cleaners market on a global level. According to the research study, global vacuum cleaners market is likely to grow at a CAGR of 4.7% during the assessment period, and reach nearly US$ 20 billion in sales by 2028-end. 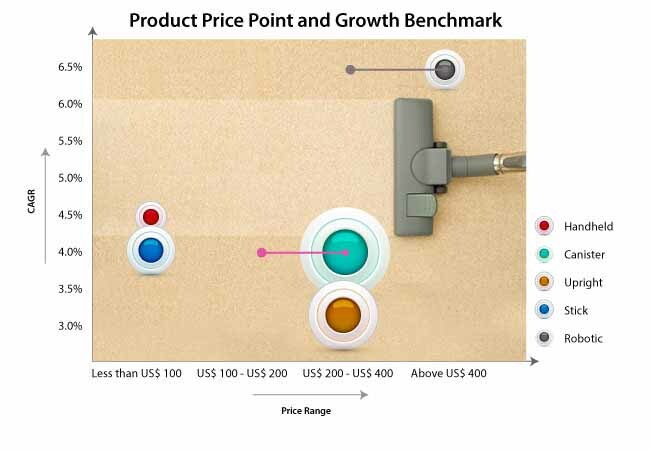 The report also includes a detailed analysis on the product price point and growth benchmark. This information is offered for various types of bagless vacuum cleaners, including handheld, canister, upright, stick, and robotic. With the autonomous concept trending in the consumer electronics industry, focus of manufacturers has turned towards development of robotic bagless vacuum cleaners that perform cleaning operation without human intervention, further enhancing the convenience quotient for users. The report forecasts that the global demand and sales volume of robotic bagless vacuum cleaners is projected to expand at a meteoric rate during the period of forecast, surpassing their canister counterparts. Growing preference for efficiency and durability, robotic bagless vacuum cleaners have witnessed increased consumer preference, which in turn is expected to support the growth of the bagless vacuum cleaner market during the forecast period. On the other hand, canister bagless vacuum cleaners are expected to trail their robotic equivalents with a significant demand during the 2018-2028 timeline. The Fact.MR research study also offers analysis on the end-user profile of bagless vacuum cleaners. According to the study, growth of bagless vacuum cleaner market is largely influenced with the increasing adoption levels of bagless vacuum cleaners in commercial and household sectors. However, demand for bagless vacuum cleaners in household is expected to witness an upsurge, given the stringent norms by OSHA regarding safety of indoor home environment. Further, the report forecasts that the demand for bagless vacuum cleaners in the commercial space is also projected to increase substantially, albeit at a lower base as compared to household sector, as demand for these cleaning devices has proliferated across various public entertainment sectors such as malls and theaters.